Police have made an arrest in the fatal stabbing of a woman in the PATH on Wednesday, April 10, 2019. A 19-year-old Toronto man accused of stabbing his mother to death in the city’s underground PATH system made a brief appearance in court at Old City Hall on Saturday morning. Rae Cara Carrington, 51, was attacked in a PATH food court, located near King and Bay streets, at around 7 p.m. on Wednesday. Paramedics said they found Carrington at the scene suffering from severe stab wounds. They attempted to revive her but the mother of eight children was later pronounced dead at the scene. 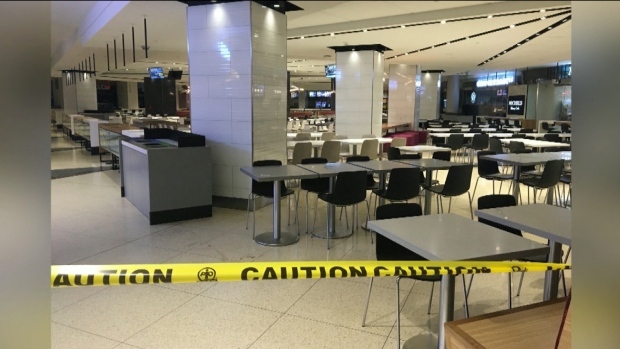 A witness told CTV News Toronto they heard a woman scream hysterically at one of the food counters in the food court and then saw someone slumped lifeless on the floor nearby. Others said the suspect drew a large knife and then fled the scene on foot. On Friday just before noon, Southern Georgian OPP officers arrested the suspect in Midland, Ont. He was identified as Duncan O’Neil Sinclair. He faces one count of first-degree murder. Sources told CTV News Toronto Carrington was living in a women’s shelter at the time of her death. Standing in a white jumper with his hands in handcuffs, Sinclair appeared before a judge just after 10 a.m.
His lawyer requested a publication ban and Sinclair was ordered not to contact nine individuals in relation to the case. Sinclair will appear next on April 23 at 11 a.m.